Happy Friday...I know it's been forever since I did a Stampin' on Friday Video. I'm getting my mojo back and already have 3 videos ready for next week. I have a little Father's Day Card series planned for next week. Ready for today's video? It's a simple one layer anniversary card. I search PTI's site for the Botanical Blooms stamp set put couldn't find it. I love Simon Says Stamps Exclusive Stamp sets...Beautiful Words is such an elegant stamp set. 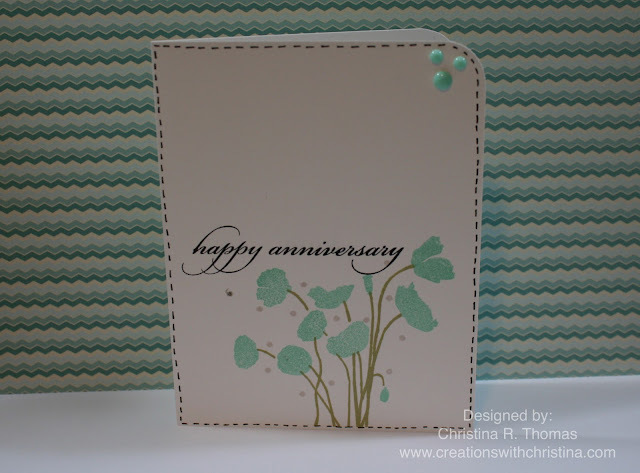 Good to have you card-making again and I love, love this clean and simple one layer card. Glad to see you got your mojo back. I've missed the creative Christina! Such a pretty card....love the soft colors. Just lovely, you make it look so easy! Beautiful little card and I loved your video. This is an awesome card Christina! Love that pretty stamp set! Love the pretty simplicity of this card. I love that stamp set. It was an anniversary set, that's why you couldn't find it.